My daughter painted her first pumpkin over the weekend. And I must say, she did a damn good job. She carefully touched the pumpkin to feel the texture, examined the shape from all sides, loaded up her brush and carefully started on her masterpiece. She was completely in the moment. She’s was not thinking about what happened to her yesterday, or what she was going to do later that day. 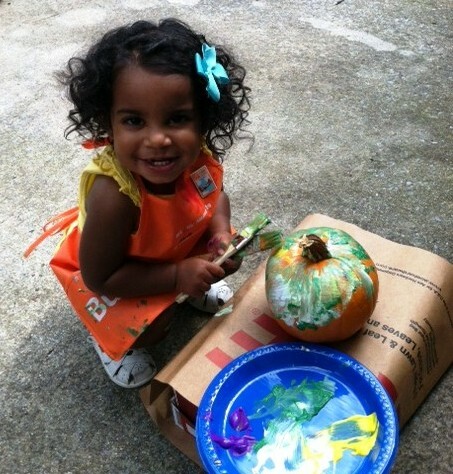 The only thing that mattered to her was the paintbrush and the pumpkin. And in that moment, the only thing that mattered to me was her. As a parent, my goal is to always be in the moment when I am with my family. This means that work can wait! I’ll still find time to check my email on my phone on weekends, but not when memories are being made.